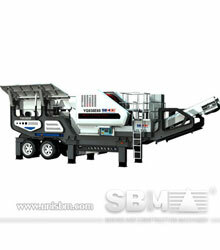 SBM YG series portable jaw crushing plants are widely used to crush the large materials and also screen those crushed materials. In quarry mining, building and construction, SBM YG series portable crusher plant can be used to pulverize and screen stones, cements, concrete and so on. SBM YG series portable jaw crushing plant is installed with hydraulic-drive feeding plate which is convenient and reliable. And the hydraulic-drive feeding plate can be extended or widened with the two-layer structure. The YG series feeder grates pre-screen smaller-size material; its collecting hopper has automatic door, and so excurrent material can be conveyed by side belt or main belt either. "The Kibali project made good progress both for our gold mining and for SBM global developing which also remains on track to update the further cooperation."